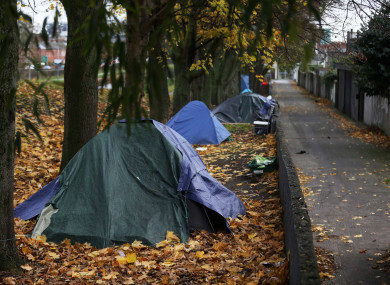 THE NUMBER OF homeless people living in emergency accommodation in Ireland has dropped since last month, but the Department of Housing has announced that more people have been re-categorised out of the emergency accommodation figures. The Department of Housing has recorded that there were 5,834 adults and 3,693 children in emergency accommodation during the recorded period last month – a total of 9,527 people. However, the Department of Housing says these figures follow the completion of an exercise to ensure the correct categorisation of emergency accommodation. A decrease in emergency accommodation figures were seen for the first time in years last March when the Department removed a number of people from its figures after it claimed to have “erroneously” overstated previous numbers. At the time, Minister for Housing Eoghan Murphy said that a number of local authorities had “erroneously categorised individuals and families living in local authority owned or leased housing stock, including some instances of people renting in the private sector but in receipt of social housing supports, as being in emergency accommodation”. The move had caused major debate from opposition politicians. Over 250 more people were removed from the figures again in April. An analysis of the issue can be read here. Murphy confirmed to the Oireachtas Housing Committee earlier today that another 741 people (490 adults and 251 children) have been removed from the homeless figures since the last removals. He couldn’t confirm how much of the decrease in people in emergency accommodation in August are as a result of “re-categorisation” rather than actual exits from accommodation. “Earlier this year, a number of categorisation errors were identified and corrected in the March and April reports,” Murphy said in a statement this afternoon. “These had involved the categorisation of individuals in houses and apartments owned or leased by the local authorities or Approved Housing Bodies as being in emergency accommodation. I had requested a report on the full extent of this practice,” he said. The Department of Housing recently submitted a report to Murphy on the matter, he added, “which identified further local authorities categorising houses and apartments as emergency accommodation”. He said the relevant local authorities have amended these categorisations. Reacting to the news that some people have been re-categorised from the figures again this month, The Simon Communities has called on the Department of Housing for clarity of the “reclassification” of households removed from the numbers. “There is confusion on the re-categorisation of households which the Department acknowledges have been removed from the figures,” Niamh Randell, spokesperson for The Simon Communities has said. “If people living in temporary apartments or houses, paid for by Section 10, this is still deemed emergency accommodation. Where are these figures recorded and reported on?” she said. Meanwhile, Sinn Féin housing spokesperson Eoin Ó Broin has called today’s figures “meaningless” because Murphy had confirmed that 741 people had been removed from the figures over the past few months. “In total, 1,606 adults and children have been removed from the homeless figures by the Minister since the start of the year. This is not acceptable,” he said. “It is time for responsibility for the publication of homeless figures to be taken away from the Department of Housing and given to the CSO. I will be requesting that the Housing Committee have an urgent meeting on this issue,” he added. The Department of Housing said it is being advised by the CSO on the development of a revised methodology for collection and publication of homelessness data. Email “Homeless figures remain below 10,000 ... but government says more categorisation issues identified”. Feedback on “Homeless figures remain below 10,000 ... but government says more categorisation issues identified”.